These were pretty tasty, but the flavors weren’t nearly as strong as they were in the mashed potato, probably because we ended up having to add quite a bit of flour to get the dough to the correct texture. So, I’d definitely recommend adding some more of everything — garlic, Parmesan, and pumpkin — to get the flavors to punch through. The recipe below includes our suggested amounts, not the actual amounts that we used. Also, as a sauce we decided just to do brown butter, figuring it would accent the flavors nicely. That, with some additional Parmesan grated over the gnocchi, made this quite yummy indeed. We made these gnocchi with a friend, Colleen, who made some ridiculous Indian green beans as a side (the photo above is with leftovers!). We promptly stole the recipe and have made her beans several times since, so never fear, that recipe will be posted in its own right eventually. Start off by roasting the head of garlic. Preheat your oven to 350. Cut the top “hat”-like portion off of the garlic, nestle it in aluminum foil, sprinkle it with salt and pepper, and drizzle it with olive oil (don’t you just want to eat this already?). Wrap up the aluminum foil around the garlic, creating a little package, and place in the oven to roast for about 30-45 minutes, until it softens. While that’s roasting, bring a large pot of salted water to a boil. 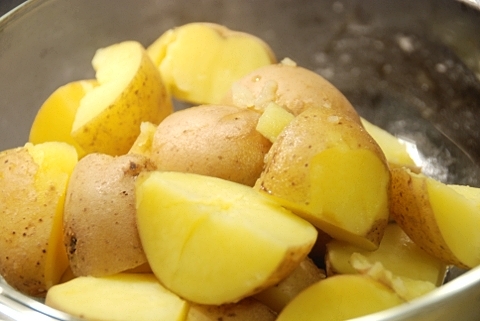 Chop your potatoes into quarters (optional, but helps them cook faster) and boil until they are fork-tender. Just like you would with any mashed potatoes, drain, place in a large bowl, and mash them up with a fork. 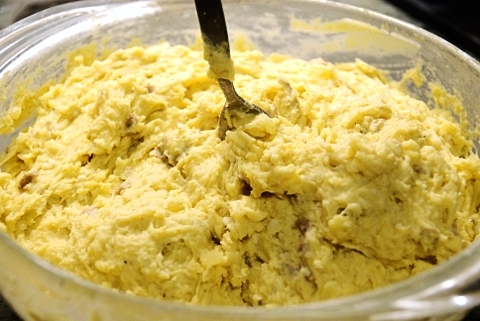 Add the butter and mash that into the potatoes as well. At this point, if your garlic is finished, pull it out of the oven, unwrap the aluminum (which will cool down astoundingly quickly), and squeeze the cloves out into a small bowl. Careful, because while the aluminum foil will not be very hot, the garlic itself will be, so you might want to handle it using a paper towel or some such thing. 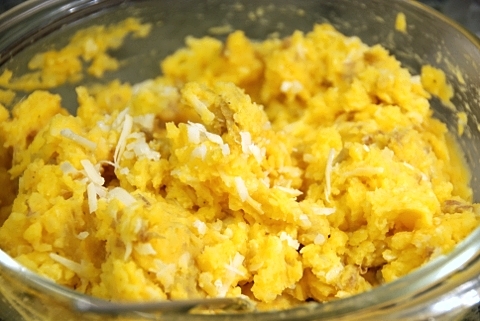 Mash the garlic in the bowl, and then add it to the potatoes, along with the milk, pumpkin, Parmesan, and a sizeable dash of salt. Now comes the gnocchi-fying! Start adding flour, mixing it in until you get it to the proper texture. You can probably start with about 1 cup and be safe, and then continue to add more in smaller quantities. As described in my earlier gnocchi post, you want it to be roughly the texture of “loose play-doh” before it’s done. At this point, get another pot of salted water boiling. Liberally flour a cutting board or counter, and scoop out a handful of dough. 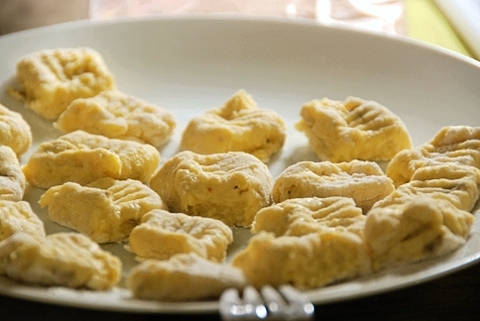 Roll it out into a long, thin snake of dough, and cut it into small gnocchi pillows. Continue doing this with as many “snakes” of dough as you wish, depending on how many people you’re feeding — this makes quite a few gnocchi; we were eating it for days afterward. Press ridges into the gnocchi with a fork, if you wish, and then drop them in batches (depending on how big your pot is) into the boiling water. You will know they’re done cooking when they float up to the surface; as each gnocchi floats up, you can just fish it out with a slotted spoon. 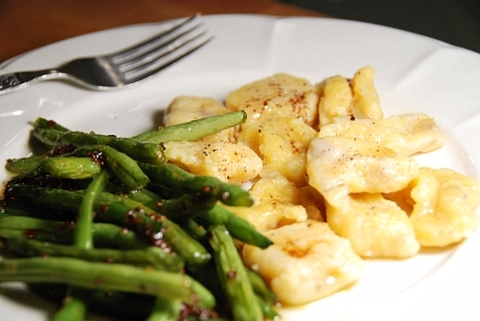 As you are boiling your gnocchi, you can also get started on the brown butter sauce. 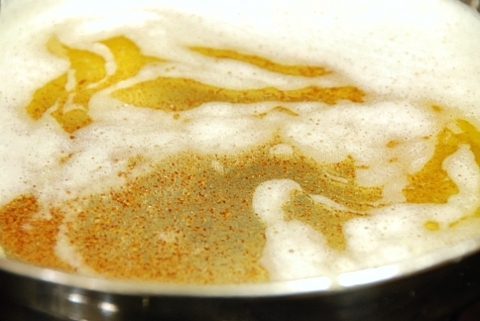 It’s quite simple: melt the butter in a large pan over medium heat, stirring fairly regularly, for about 10 minutes. You’ll know when the butter is brown, because it will be — well, brown. And it will smell absolutely delicious. Be careful not to go too far, or it will burn. But it’s pretty self-evident when this butter sauce is ready. 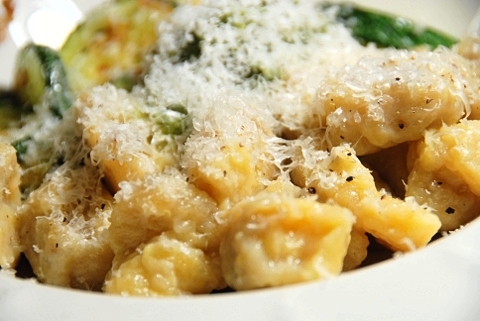 Drizzle on top of the gnocchi, grate some Parmesan, and serve with a nice glass of white wine. Mmm. Thanks for stopping by, and I hope you enjoy the gnocchi! I whipped these up when I had some time to kill before work–I froze them uncooked on cookie sheets and transferred them to a plastic bag, and now I have delicious gnocchi whenever I desire! I also stuck the cooked gnocchi in the browned butter while it was still browning to give them some crispy edges–worked pretty well, and gave a nice textural difference. « What Happened?? Why Is It So Dark in Here? You are currently reading Pumpkin, Garlic, & Parmesan Gnocchi at Nombudsman.